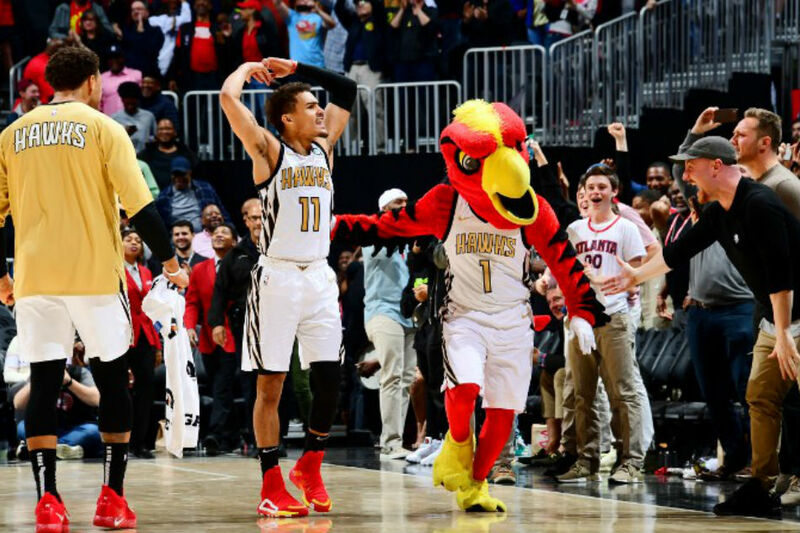 Rookie point guard Trae Young scored 32 points, including the game-winner with a tenth of a second remaining, to give the Atlanta Hawks a 129-127 win over the visiting Philadelphia 76ers on Saturday. The Hawks tied the game 127-127 on a layup by Taurean Prince with 27.5 seconds left, then got a final shot when Philadelphia allowed the 24-second clock to expire. With 3.5 seconds left, Atlanta's Kevin Huerter inbounded the ball to Young, who made a floater over Jimmy Butler to put the Hawks ahead. After calling timeout, Philadelphia's inbounds pass hit the rim to end the game. The win was the second straight over a playoff team for Atlanta, which beat Utah on Thursday, and broke Philadelphia's six-game winning streak. Young finished 11-for-20 from the floor, including 4-for-9 on 3-pointers, and had 11 assists for his 26th double-double. Prince scored 23, with four 3-pointers, for his most points since Nov. 11. Dewayne Dedmon added 17 points. Philadelphia got 27 points and 12 rebounds from Joel Embiid, 25 points from Butler and 21 points and nine assists from Ben Simmons. Butler was 13-for-13 from the line and scored Philadelphia's final six points. The fast-paced first-quarter included 11 lead changes. The Hawks led by as many as six, but the Sixers used a 9-0 run and took a 41-34 lead into the second quarter. Philadelphia led by eight before the Hawks seized the momentum and built their own nine-point lead at 60-51 on John Collins' jumper with 5:42 left in the half. The Hawks led 74-68 at the break, with Young scoring 21 points. The Sixers lost backup T.J. McConnell with 3:43 before halftime when he ran into Atlanta's Jaylen Adams, who was waving his arms while trying to direct a play. McConnell, who appeared woozy and went straight to the locker room, returned in the second half. Atlanta led by as many as 12 points, 97-85 with 4:29 left in the third quarter, before the Sixers went on a run that allowed them to tie the game at 100 on JJ Redick's 3-pointer with 5.5 seconds left in the frame. Atlanta led by four points on four occasions in the fourth quarter before the Sixers took the lead on a pair of Butler free throws and a drive by Simmons that made it 121-118 with 2:12 to play. Atlanta answered with a free throw from Collins and a slam by Huerter, which gave the Hawks a 122-121 lead with 1:37 left. Atlanta has won two of the three meetings in the series this season. The two teams play again on April 3 in Atlanta. Puerto Princesa International Airport, fire hazard?